1. Open up a blank document on your laptop and set the font to a large size, and let them type letters and numbers. 2. Have Tons of coloring books on hand. 3. Set up a fort with the sofa cushions and gate off the area so the little one(s) can't take off. Throw some toys in there and there you have instant mommy break! 4. Set the baby in his/her highchair with a couple of plastic bowls of yogurt colored with some food coloring. It's a baby's equivalent of finger paint and it's safe for ingesting. 5. And if all else fails and you REALLY need a break, I'm sure grandma would be happy to have some company! I feel like one of the biggest (and most offensive) misconceptions about being a mother, is that we don't deserve breaks. I have heard people say that if mothers wanted breaks they shouldn't have had kids and all kinds of other wild judgements. But I have to say this. 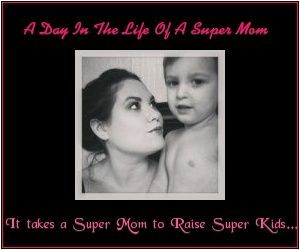 A true super mom can admit that she needs help or that she needs a little break. Not only is it good for the mom, but the child benefits by having a refreshed, happier mother.